The final day of the wedding was in the temple where they went to take the blessings of the local priest. We all had to wear the local kebaya sarong and a sash. I decided to rent it, which was a wrong idea, as everyone in Indonesia seems to be of size 1 or 2. With great difficulty, I found one outfit that fit me and I was thankful for being spared shopping at this last minute. We all got ready and went to two temples where they did ceremonies and blessed the couple. The temples were very simple, green and peaceful. Some of the offerings near the alter were made using sprite bottles and people were wearing shoes and smoking inside the temple. They had two roasted pigs on a skewer as an offering to the Gods. Ritualistically, it felt wrong to wear shoes and allow smoking and meat in a temple but spiritually, the place felt very clean and content. I felt that the Indonesians might have altered some of the Hindu rituals (or may be they are right and we altered it in India) but they were really dedicated people. Every home has a beautiful temple as a part of the premises. Most of the hotels and homes have Ganesha at the entrance. I love the way they retained the beauty and elegance of the ritual. After the ceremony, we walked over to the dinner area. In an open area, they created a huge circular arch of intricate bamboo weaves for dinner seating. We entered the arch, and sat down on the floor on the mats that was laid on both sides of a long table running below the circle of the arch. Food was served on banana leaves and was covered with banana leaves. As we uncovered the top set of banana leaves, we saw that the food was served community style where the rice was in one continuous motion in the middle surrounded by various dishes. All of us dug into it and had the most amazing conversations. Post dinner, there was Balinese dance and puppetry in a small theater across the street from the dinner area. There was also some gambling that you played with shells and not money. What was amazing to me was that EVERY aspect of the wedding, be it the locations or how the food was served to the trashcans … everything was recycled or natural. The ceremony was not trying to adopt “green” principals.. it was “being green” in the way it existed. No one was trying hard to be ecologically correct, they just were so .. naturally. 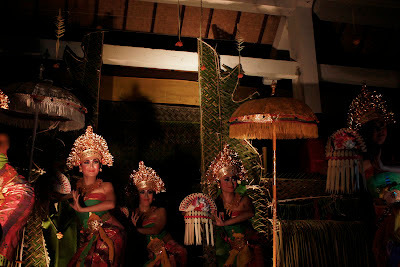 That is what I love about Bali. From something temporary as the little baskets they weave to carry the flowers for the offering to the permanent structures of homes, it is filled with perfection and beauty. No one is being taught design or ecology or even religion. They are everything that you need to be .. naturally. May be I enjoyed only the privileged hospitality where it SEEM like everything was natural but even if that were so, I can say that I have not found that same sense in the most elaborate homes in India. 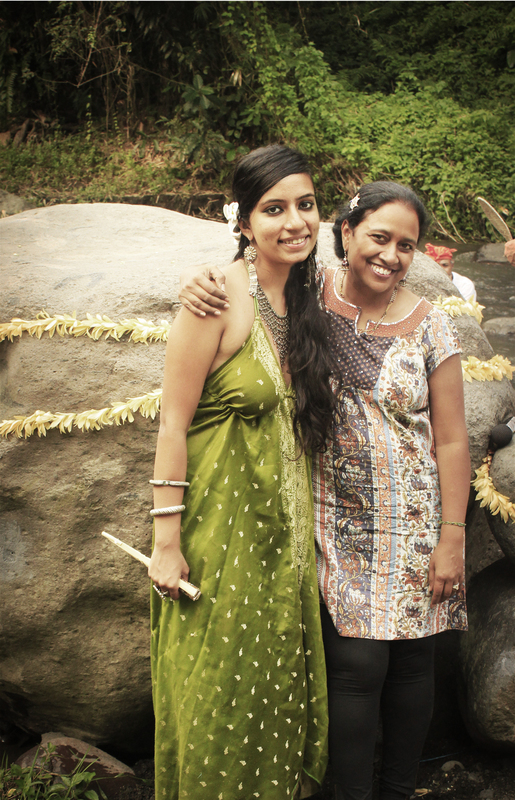 Bali made me feel at home, with myself, with nature and with the natural order of the world that exists around me. 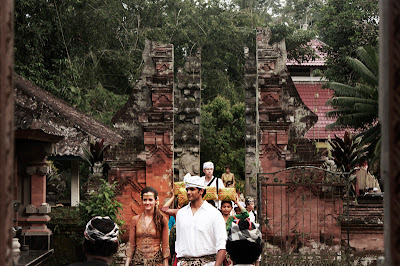 And the wedding was a magical vehicle that encompassed what Bali was about in the most beautiful way. I know why I go to weddings. Despite all the statistics that stare in our face, despite the number of adjustments two different people living under the same roof, we do our best to create these magical moments with all those we love so that later on, when we face tough times, we have someone or the other remind us of the magic of why we got married in the first place. 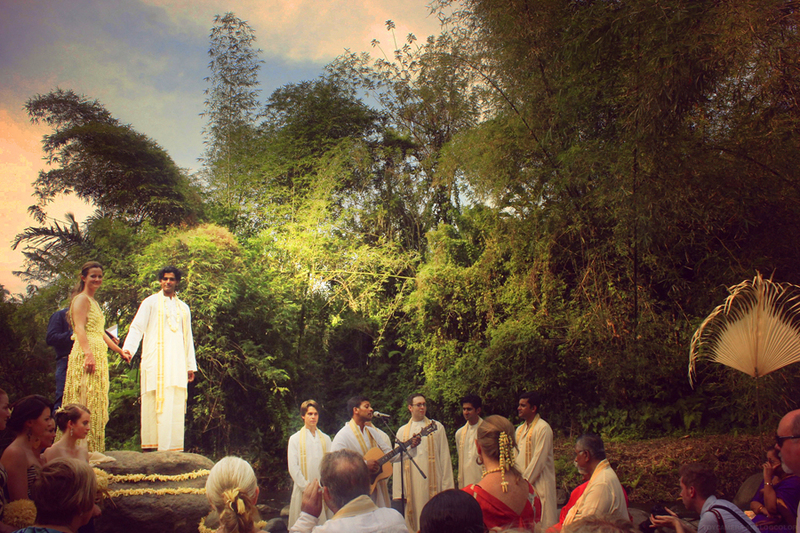 Standing on that rock, when the tall, dark Malayali American Rajiv kissed the slim, elegant Canadian Balinese Elora in her flower dress, with a flowing river acting as the background music, time stood still and I enjoyed the love that existed in that moment. What happens later is up to Elora and Rajiv and I get to keep that moment for a long time to come. Lakshmi that was a great read. I can see nature so romantically included to be a part of such an important moment. Beautiful couple and stunning place! I wish my wedding in catering suffolk would be this romantic!